There is a reason Austin's upcoming indie music festival is called Fun Fun Fun. 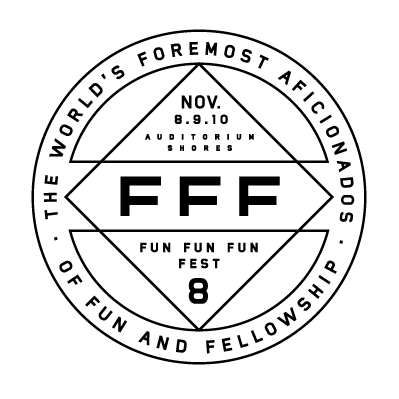 Currently on its eighth year, FFFF will be providing another roundup of incredible music performances, comedians, action sports and their notorious taco cannon on November 8th to November 10th. This year's headlining acts are MGMT, Snoop Dogg, M.I.A., Slayer, Jurassic 5, and Sarah Silverman. Oh and did I mention Slayer? Yeah. A full lineup of the schedule is up on their site and below is a mini playlist of the bands we are excited to see. Although student passes are all sold out, three day passes are still available as well as single day passes. Each pass offers fun in the day and "nite". Headliners for "nite" parties include Kurt Vile, RJD2, Star Slinger.. etc. If the mini playlist and taco cannon (yes, during the festival, there will be breaks of free tacos to the general public shot from a cannon) didn't get you sold on the festival, the three consecutive days of fun will be outside in the perfect 70 degrees weather– essentially making it the happiest place on earth in November. Hurry up and grab a pass before it's too late! Make it rain, taco cannon!